The more I read picture books, and I read a LOT of picture books, the more I realize that the most successful picture books are those where the writer and illustrator complement each other perfectly. I Spy Dad is such a book. Written by Janeen Brian, illustrated by Chantal Stewart, and published by New Frontier (2009), I Spy Dad is a charming romp with delightful characters, and is perfect for reading aloud. I would love to meet Janeen Brian. I am betting she has a great sense of humour, and a flair for drama, as well as her undeniable talent, because that's the way she writes. I love her books and have reviewed Wishbone, Silly Galah, Too Tight Benito, Where does Thursday go?, Columbia Sneezes, Oddball, Elephant Mountain and By Jingo! an alphabet of animals here at The Book Chook. You just can't help loving this book. It's a celebration of dads - reading dads, weeding dads and even lively-leading dads. In Brian's impeccable rhyme, we meet all sorts of dads, and Stewart ensures they are all sorts visually too - different ethnic origins, professions and appearances. The illustrations are lively and fresh, a perfect complement to Brian's playful story. I spy with my little eye dads all starting with d.
But can I find the one who's mine? I wonder where he'll be. Kids love to play the I Spy game, so they'll instantly want to join the search. And I know they'll enjoy looking at all the dads and comparing him with their own as the story proceeds. The I Spy game itself would be a great way to either follow up or introduce the story. Older brothers and sisters might like to join in and spy objects that start with certain sounds, and little ones can look for things that are red, or round, or have legs. I Spy Dad would make a great picture book for students studying families, or multiculturalism. I think it would also make a lovely gift for a dad who wants to share a special book with his child, one that shows dads in various roles, and reaffirms our understanding that all dads are special people. 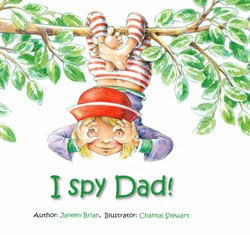 http://bit.ly/cM0O5W Latest Book Review, I Spy Dad by Janeen Brian and Chantal Stewart. Delightful<wbr></wbr>! You write such a good book review Susan that I am off to find a copy of this myself. What a cute book! This would be a great one for kids to share with their dads on Father's Day. When we were kids, my mom always helped us find a book to share with dad for Father's day. We continue this tradition even today! That's a lovely tradition, Kelly! I'm so glad, Joy. I think your teachers will see the value in a book about dads, too. I'll be looking for this one come Father's Day. Janeen has a new one, I Spy Mum, coming out just in time for Mother's Day too!